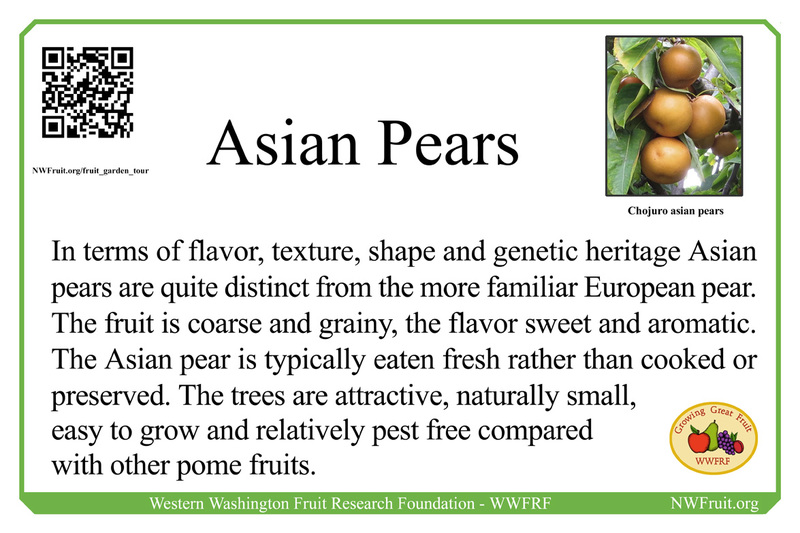 The groups of fruiting trees known as “Asian Pears” comprise several species native to the Far East. Asian pears are not strong growers. Consequently propagation calls for grafting onto a vigorous European pear or wild pear rootstock. The tendency of Asian pears to produce dwarf trees is an advantage to the space-conscious fruit grower; they grow to half the size of a European pear on identical rootstock and adopt a more manageable, spreading habit. In its homeland, the Asian pear is highly prized for its large size, round apple-like shape, delicacy and sweetness. Their large size makes them an extravagance to eat alone, so they are usually regarded as a treat or given away as gifts. There seems to be a vast cross-cultural consensus that Asian Pears are best eaten fresh, out of hand. However, their sugary juice can also serve as vinegar-making stock or as a substitute for simple syrup.